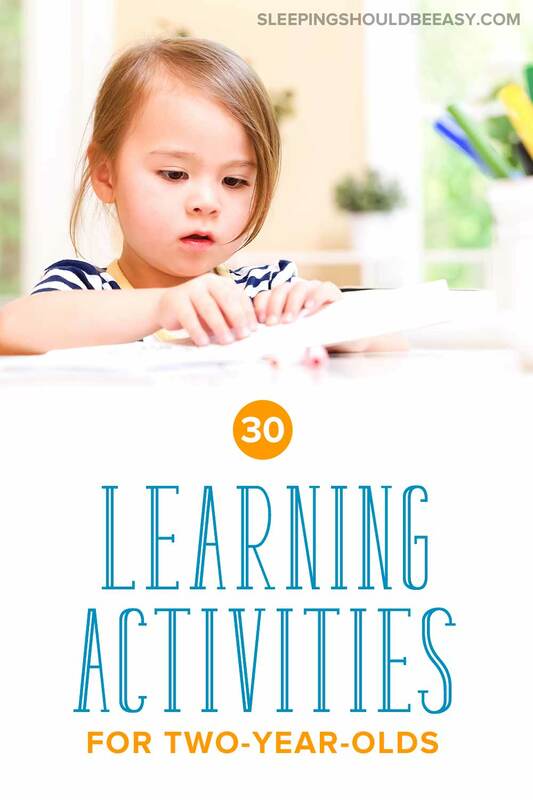 Discover 30 learning activities for 2 year olds! From educational to outdoor to craft activities, get a list of ideas to do with your toddler. I’ll be upfront: I’m not your typical crafty mom. I don’t stock sensory bins or organize trays of card stock at home. As a working mom, I don’t always have the time, and I especially didn’t when I worked a typical 9-to-5 job. I also didn’t like how many of the learning activities for 2 year olds seemed to focus more on the parents’ crafting skills, not necessarily the child’s. And finally, I’m more interested in child-directed learning, not necessarily the “final product.” It’s not so much about creating a beautiful item as it is about allowing kids to be curious and ask questions. Still, even as a non-crafty mom, I still wanted my kids to learn, especially in the toddler stage. At that age, they still have the same curiosity as when they were infants, but with the dexterity to do more complex tasks. Perhaps you can relate. You’re more than willing to teach, you just need to do so in simple ways. Where you can use regular materials found in your home, and fit them into your tight schedule. And where the focus is more on the learning that takes place rather than the final product. I’ve listed learning activities for 2 year olds I’ve done with my kids when they were that age not too long ago. I divided them into five categories for a total of 30 activities (which makes for a fun month-long challenge!). I purposefully kept these activities fun but also realistic to do. You won’t need to buy science kits or craft supplies galore. And if you do decide to buy anything, they’re more than likely going to be used over and over. And they’re simple. We’re all busy, and we know kids don’t exactly sit still for hours at a time. I’m not joking when I say you can do these every day of the month if you’re inclined! These are activities I’ve done with my own kids, so if I can do it, so can you. Sort items by color. Find a set of similar items and sort them by color. A few ideas include Lego pieces, magnets, blocks, cars—anything you’ve stored in a box! Start the task and ask your 2 year old to help you sort them by color. Count everything. Play a game of counting everything. You can start with the items mentioned previously such as Lego pieces and cars, as well as any opportunity to count you come across. Climbing a set of stairs? Count how many steps you take. Eating raisins? Count the pieces he feeds himself. Cut straws by size. Do you have a box of straws in the kitchen? Play a game where you create 10 pieces of straw, ranging from one-inch long to the full size (tip: you’ll only need five straws to make all 10 pieces). Shuffle them on the ground and encourage your child to arrange them in order. Sink or float. Gather a few household materials or toys and experiment to see which ones sink or float. You can do this during bath time or pour water into a large container, such as a large bowl, water cooler, or kiddie pool. Find items that are water-safe and have different weights so your 2 year old can see different results. Letters in the tub. A fun toy I got my kids was a set of foam pieces of the alphabet (this is the one I got). I was able to introduce them to letters and even spell simple words. Trace and write letters and numbers. Simple worksheets are a fantastic way to introduce your child to letters and numbers. Nature scavenger hunt. Visit your local park and ask your child to find common items you often see. Maybe that’s pine cones, leaves, twigs, rocks, pebbles, or flowers. Make a simple list and have him collect his findings in a bucket. Collect and compare leaves. Collect a variety of leaves outdoors. Then, lay your findings in a row and talk about how each leaf looks and feels. Plant a seed. Whether in a backyard or a pot, plant a seed with your child and watch it grow over the next few days and weeks. Start with a large seed such as lima or green beans, as those not only are easier for your child to hold, but grow quickly. My favorite source for seeds is Renee’s Garden. Bucket of ice. At a children’s birthday party at a friend’s home, I was surprised by how intrigued the kids were over a simple bucket of ice. The adults had emptied a water cooler of the drinks, leaving ice and water. The kids eagerly grabbed pieces, experimenting with the touch, before moving them to the grass and watching it melt. Mud play. Another fun (but messy!) activity is simple mud play. Find a spot in your backyard or park and pour water into the soil. Bring kitchen play items (stainless steel ones like these are easy to wash for indoor use again). Or you can even take old kitchen items you no longer use so your child can also practice pretend play. Sidewalk chalk. 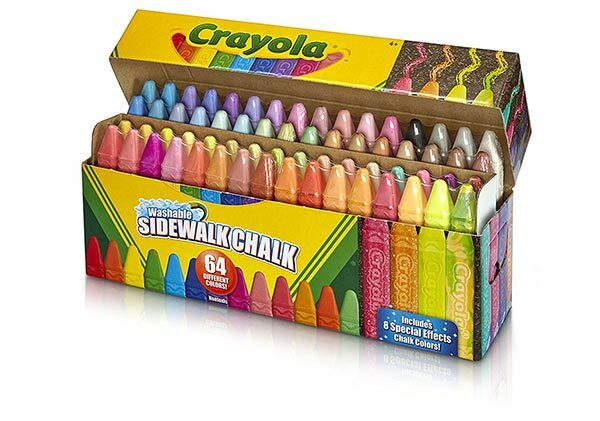 Grab a set of sidewalk chalk (I like these) and head to your sidewalk or park. This gives him a chance to draw on his own, but is also a fun way to introduce shapes and colors. Play dough. You can do so much with play dough. You can roll it into balls and count them one by one. Roll it into strings and spell the letters of your child’s name. He can even pick at the play dough and experiment to see how it works, and that’s fine too! Fractions with paper. It doesn’t get any easier than this. Grab a sheet of paper and cut it in half. Explain how the two pieces make up the whole paper. Go further and cut those two pieces in half, making quarters. Keep going again, making eighths. After each round of cutting, assemble the paper so that your child can see how all the pieces form the original sheet. You can also get these pizza fraction toys to make it even more fun. Matching game. 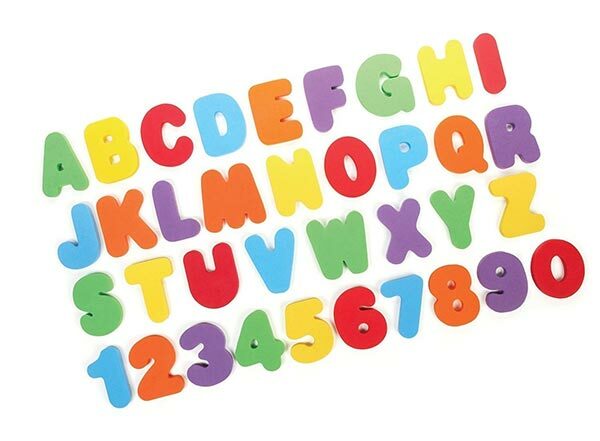 Using card stock or index cards, write two sets of the letters of the alphabet and have your child match them together. Start with a few at a time so as not to overwhelm him with all 26. Glue by color. Using magazines, junk mail, or construction paper, cut tiny pieces of paper. Then, on separate sheets of paper, draw two circles per sheet using different-colored markers. One sheet might have a blue circle and a red circle, while another has a yellow and a green one. (You might want to make the outlines thick so your child can tell the colors apart easily.) Then, have your child glue the pieces of paper into the appropriate circles. If you’re using magazines or junk mail, try to cut pieces with a solid color. Color mixing. Kids love to paint, and so much more when they get to mix and make new colors! 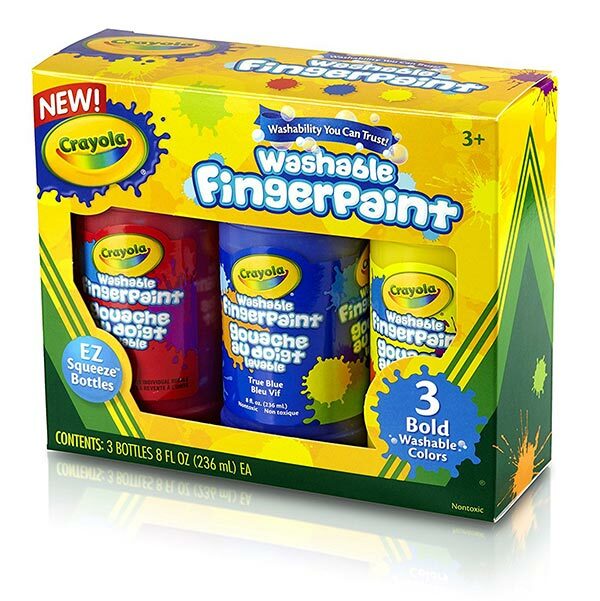 Using just the three primary colors (this set is the one I used), show your child how to mix and match to make new colors. A few to try: red + blue = purple, yellow + blue = green, red + yellow = orange. Counting with dot markers. Like the straws activity above, have your child practice numbers with dot markers (like these). Print two sheets of paper in landscape format, with the numbers 1-10 along the side. 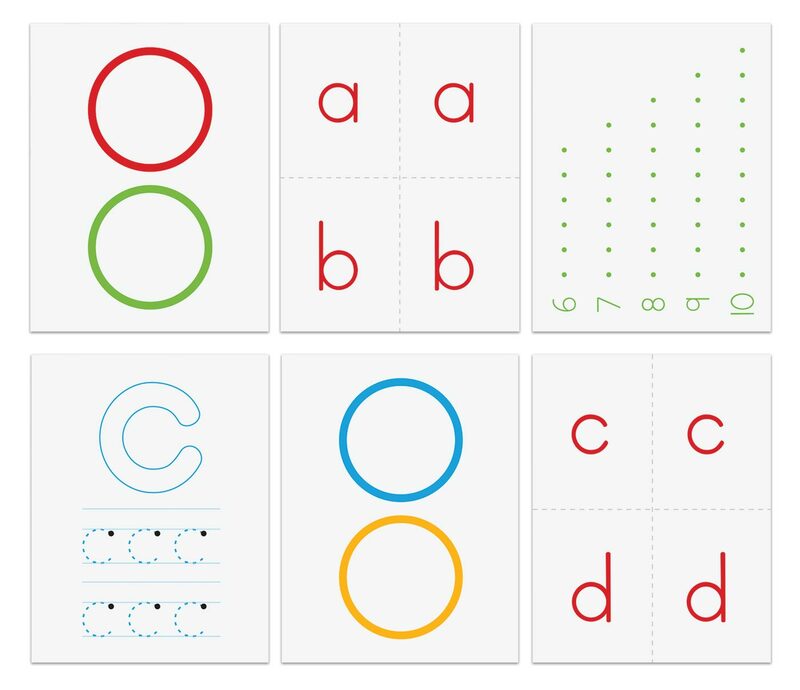 Show your child how to color the appropriate number of dots next to each letter, counting along with him. Make these activities even easier with my printable learning activities! Join my newsletter and you’ll get a set of A-Z alphabet letters to play the matching game, sheets to glue by color, and printables to count with dot markers. Sweep into a square. Encourage your child to do chores with simple sweeping! Using painter’s tape (we have a bunch of these at home), make a square on your kitchen floor. Then, with a child-size broom, have your child sweep all the dirt from the rest of the floor into that square. Pouring. Place a measuring cup filled with water and a bowl on a baking sheet. 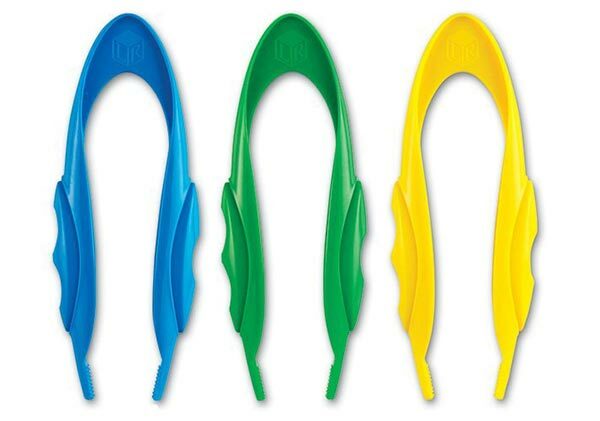 (I like this Oxo one because it’s plastic and lightweight but still has a rubber grip.) Then, have your child pour water from the measuring cup into the bowl. If you have two measuring cups, he can pour it into that so he can go back and forth easily. You can also try pouring small items like dry rice, beans, or sand. 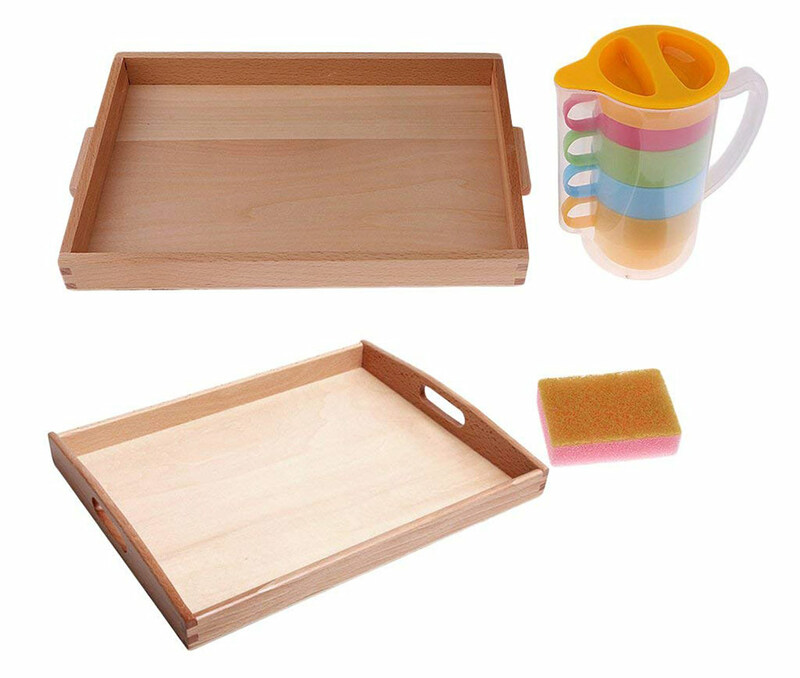 You can also get a set like this Montessori pouring kit. Basting with water. 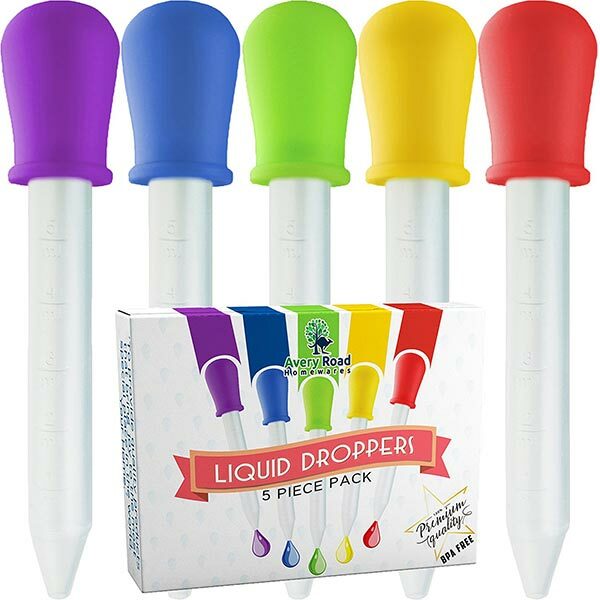 With a kitchen baster (or liquid droppers for kids like these), show your child how to collect water by pinching the baster and dipping it in a bowl of water. Then have him release the water from the baster into another bowl. Tweezing puffs. With kitchen tongs (or tweezers for kids like these), have your child collect cotton balls of puff balls from one bowl to another. If you use different-colored puff balls like these, you can also have your child sort them by color or number (for instance, make a pile of one, then two, then three, and so forth). Sorting laundry. As much as we dread laundry, you have to admit, it can provide many learning activities for 2 year olds. For instance, have your child sort laundry by type, from shirts to pants, or sort by color. He can also match socks or set aside household laundry like napkins and rags. Water plants. Kids love watering plants! 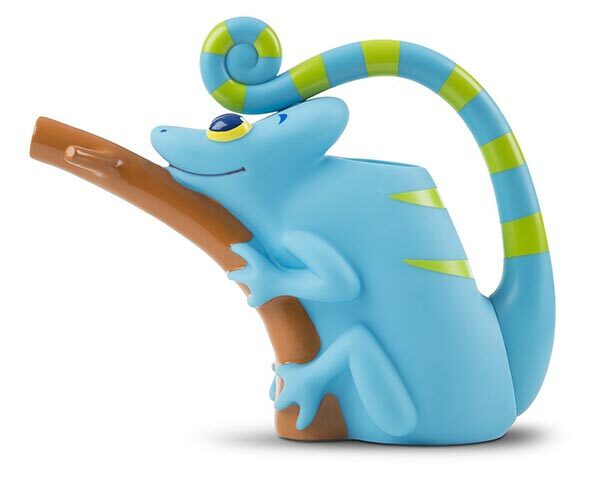 Use a simple watering can like this to help your child learn how to water both indoor and outdoor plants. Children’s museums. Nearly every major city has a children’s museum your child will love. I prefer these kinds because they invite hands-on participation rather than hollering “Don’t touch!” all the time. In Los Angeles, I love going to Kidspace, California Science Center, Discovery Cube, and Skirball’s Noah Ark. Libraries. Many libraries have activities for kids, from story time to magic shows to arts and crafts. Plus, going to the library encourages you and your family to make regular trips to borrow and read books at home. Nature walk. Explore a new trail or nature walk with your 2 year old! 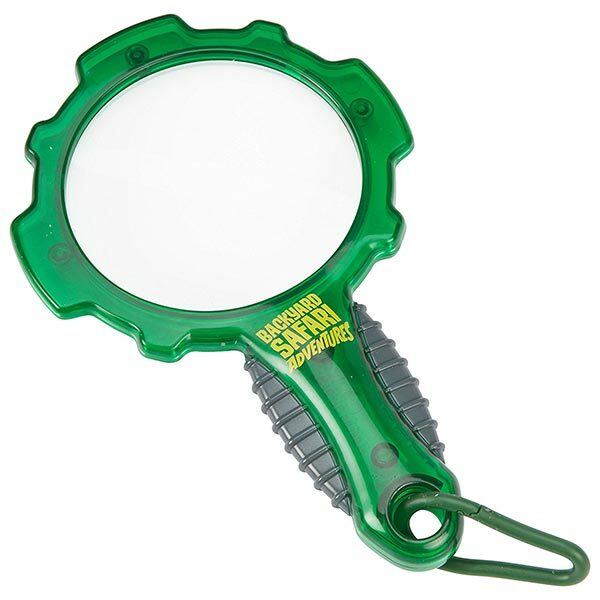 Bring a magnifying glass so he can observe curious finds along the way. Or, bring a bucket and collect them to take home. Sandbox or beach. Playing with sand either at the beach or even in a sandbox at your local park can provide many learning activities for 2 year olds. 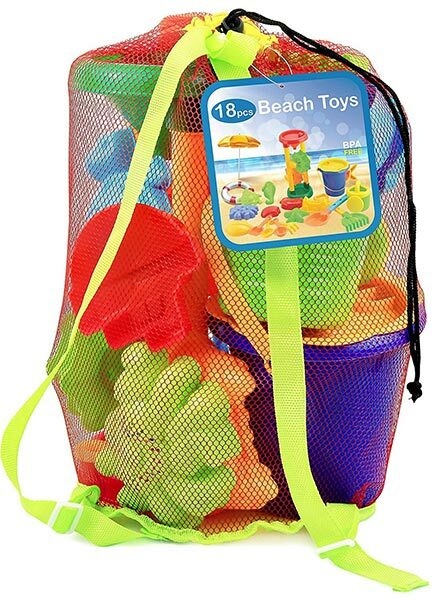 Bring sand toys and encourage your child to build, experiment with water, and otherwise learn through sensory play. Botanical gardens. I love taking my kids to botanical gardens because they invite so much exploration. The trees and plants are a bit wilder than more polished gardens, and they often include peaceful streams and even animals like lizards, fish, and turtles. In Los Angeles, my favorites are the UCLA Botanical Garden and the South Coast Botanic Garden. Aquariums. Discover the ocean and marine world by visiting your local aquarium! Your child will have an up-close opportunity to meet many of the animals who live in water, while learning the importance of protecting the planet. As you can see, learning activities for 2 year olds don’t need to be complicated or take too much time. You also don’t need to be the next Martha Stewart or produce finished crafts and products to make the activities a learning experience. 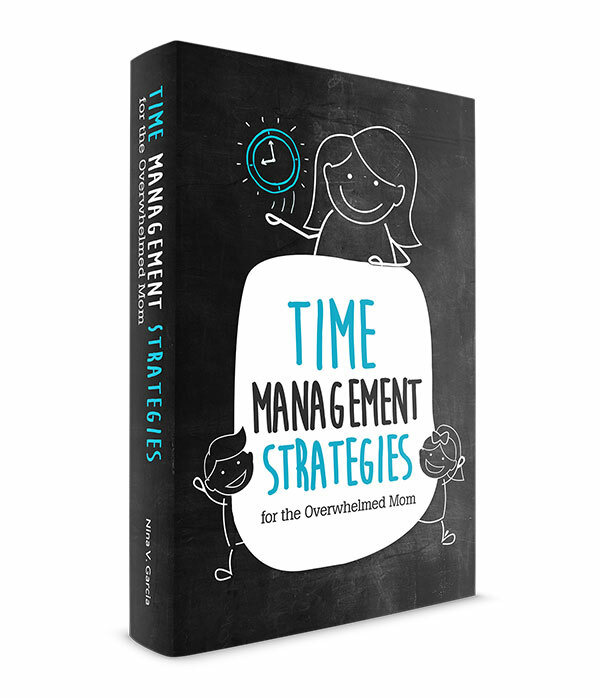 Instead, you now have at your hands a compilation of creative activities to start. Your child can play with mud or mix primary colors. He can learn about sizes with straws or water volume with measuring cups. And most importantly, he’ll continue his love of learning, especially when the activities are stress-free and fun. You can teach activities to your toddler, even with limited time and materials, or a lack of any crafty inclinations whatsoever. Tell me in the comments: Which of these learning activities for 2 year olds are your favorites?